Training in the ICU is accomplished in three to six separate ICU rotations that will generally occur during the CA-1 and CA-2 training years. 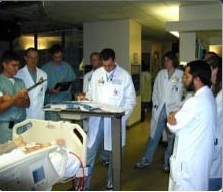 Clinical base interns may also choose to participate in the ICU. We expect that the full spectrum of the goals and objectives listed below will be accomplished by the time the third to sixth rotation is completed. In addition, we will attempt to give graduated levels of responsibility to the resident during each ICU rotation. Residents whose intern schedule requires completion of more than three ICU months will be given even more responsibility during later rotations and may be asked to function as acting ICU fellows. Clinical base rotation: Clinical base residents will be closely supervised in all areas of the rotation. They will be expected to follow fewer patients than more advanced residents. All orders will be discussed with and approved by more senior residents or fellows. All procedures will be directly supervised by faculty, fellows, or more senior residents with proven competency in the involved procedure. Clinical base residents will be expected to carry out the agreed upon patient care plans and monitor results in all patients assigned to him/her. CA-1 rotation: The CA-1 resident will be given an increased patient load. In addition, after documentation of sufficient experience and with attending approval, CA-1 residents may perform procedures semi-independently and assist in the supervision of clinical base residents in performing procedures. CA-1 residents will not initiate procedures or therapies without previous discussion and approval from the ICU fellow or attending, but will be expected to be more active in developing patient care plans. CA-2 rotation: In addition to responsibilities of the CA-1 resident, the CA-2 resident will be given an increased patient load. The CA-2 resident will be expected to be very proactive in developing both initial patient care plans and plans in response to changes in a patient’s condition, discuss the plans with the fellow/attending, implement the plans, and closely follow the results. They will be expected to be aware of and practice well-established preventive/proactive medicine relevant to common critical care problems.